This year’s contest to design the official Festival T-shirt is now open. And, as it’s the 40th Anniversary Festival, it’s a big one! 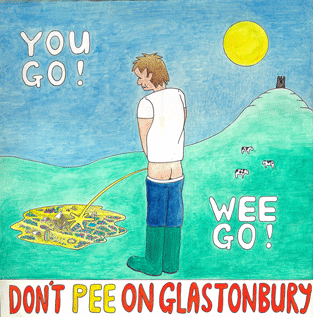 The competition will be judged by Michael Eavis. The winner will not only have the pleasure of seeing their design stamped across the chests of thousands, but will also receive two tickets to this year’s Festival and a cheque for £1,000. The competition deadline has been extended to May 8th, to allow for postal disruption due to volcanic ash. 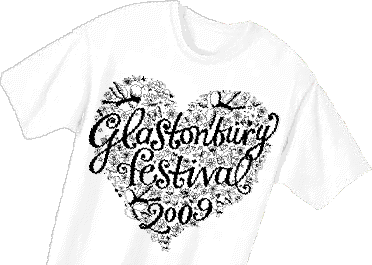 Send your entries as hard copy to Glastonbury T-shirt Competition, Q, Mappin House, 4 Winsley Street, London W1W 8HF. The winner will be contacted by phone or email (so include your details) and their winning design published in the Q Glastonbury Daily newspaper. The judge’s decision is final and no correspondence will be entered into. Head over to www.Qthemusic.com for full Terms & Conditions. The 2009 winner is pictured above.